One night in a Somerville basement a summit took place between representatives of two of Boston's musical superpowers — Birdsongs of the Mesozoic and Cul de Sac — convened by guitarist/diplomat Tim Mungenast. "Entente cordiale" rather than war was the order of business, and it became a dramatic evening of free-wheeling melodic improv and coloring outside the lines. "No Such Animal" is a rare bird indeed. It’s a new genus: Nouveau psychedelic rock, mixed with free jazz where, as Ted Drozdowski of The Boston Phoenix (another rare bird) puts it, "ideas travel on bats' wings at supersonic speed and everyone hums ragas as they catch the bus to work." Led by Tim Mungenast on electric guitar, electric sitar, and bells, and featuring stalwarts Ken Field on saxes, flute, and percussion, Jon Proudman on drums, and Michael Bloom on bass; this CD is a must have for all meta-ornithologists, improvised music lovers, and over-achieving paint-by number artists. Something totally unexpected from Tim Mungenast whose ‘Birth of Monsters’ and ‘Unstable Boy’ remains prime examples of ‘60s flavoured rock psychosis’- if you haven’t heard them imagine the wicked humour of Frank Zappa or playfulness of Gong crossed with the melodic touch of Love. Michael Bloom remains the bass player and Tim has brought in the splendid talents of Jon Proudman on drums (Don’t I know that name from the jazz world?) and Ken Field on sax and flute. Tim’s a guitarist but I wouldn’t say this is a guitarist’s album with sax and rhythm giving it a kind of ‘Things We Like’ (Jack Bruce and co) vibe. (That is on my personal favourite, the 13:50 opener ‘Debut Sea’). As with improvised jazz rock some of it is pretty well impenetrable and 75 minutes is a lot to take in. However, original touches like Tim’s ominous bells on ‘The Iron Bell’ and the same gentleman’s electric sitar on ‘Sitar-Tha’ keep the interest alive as the band attempt to conjure up a new musical hybrid like Tim’s daughter’s ‘No Such Animal’ drawing on the sleeve. The project is partially successful but the final track ‘Mungulator Ritual’ is a step too far towards dischord for me and at times ‘No Such Animal’ can be a difficult listen. It certainly has is moments and the musical approach follows in the grand traditional (albeit with different genre bases) of Radio Massacre International, Escapade and Trigon (heavy Zen jazz). MFBM is more overtly jazz than this sample of comparator bands and certainly worth exploring particularly if you like the bold, adventurous approach. This is an Ornette Coleman-like and Miles Davis-minimalist-kool collection of venturesome third stream jazz numbers that features four local avant-guardians, all with sterling pedigrees. The titles often offer clues to the artistic intent. A composition such as "Debut Sea" is notable for its elastic, silence-harboring subtlety and eclectic dynamism—rumbling bass and nimble, cymbal-heavy drumming move the composition along while at the same time circular sax riffs and a subtle cascading guitar line propel it to the finish line. The percussive and eerie flute and seesawing sax improvisations that swirl about "The Iron Bell" seems to be attuned largely to the tonalities of that instrument; "Luminous/Ominous" features a progressively menacing concourse of pulsing bass and a flute line, frantically juddering like a butterfly with a broken wing, both underscored by sinister maraca, and eventually augmented by plangent sax and wounded guitar. A similar pointedness is evident throughout the remainder of the combo's other two lengthy jam pieces; these compositions are superbly atmospheric as opposed to merely directionless tour-de-force foo-fo-raw. Why isn't this the hottest thing out there? Too esoteric? Too obscure? Too authentic? You tell me. To be perfectly candid, I know nothing about this scene--the interstices between jazz and out-indie rock. So why am I the first person to review this nearly two-year-old disc? Me, I'm blown away by this obscure musical aesthetic, haunting the spaces that separate jazz from some way-weird instrumental pop-vibe. I guess it's just that guys this edgy have got to ply their trade in obscurity: That's what they're facing, that's their gig. Too out there for the indie crowd, too obscure and lacking jazz creds, they operate in some jazz-indie nether world, heard by few, appreciated by even fewer. But, hey. There's nothing all that outré happen here--nothing that the intrepid surfer of obscure musics can't relate to: drone, world-jazz, faux Eastern jazz-lounge. This is what you get when major Boston iconoclasts Birdsongs of the Mesozoic and Cul de Sac meet: loosey-goosey jazz-rock of the highest accomplishment and listenability. Sure, they're lots of safer musics you can glom onto. But you're not going to find much more creative and evocative than this mesmeric set. Highest recommendation. 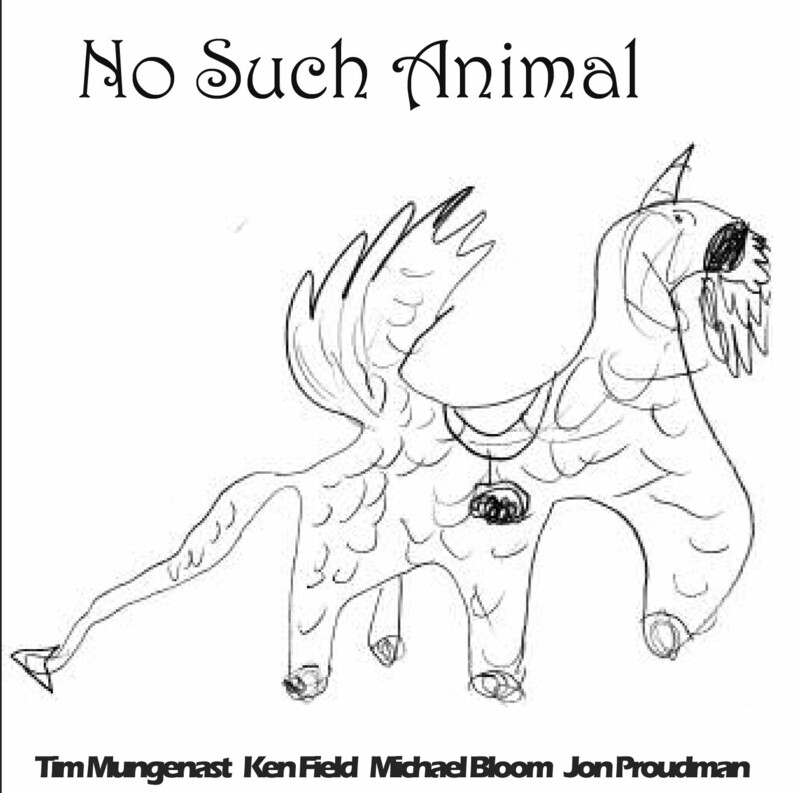 On No Such Animal, guitarist Tim Mungenast breaks with his psychedelic pop past by recruiting saxman Ken Field (Birdsongs of the Mesozoic) and the rhythm section from Cul de Sac (Michael Bloom on bass and Jon Proudman on drums) for an album of completely improvised music, but this is no furious free-for-all blowing session. These guys are all excellent listeners, and take a completely cooperative approach to making music. The songs evolve slowly; it's nearly five minutes into "Debut Sea" before any real soloing starts and even then, there's never a hint of grandstanding. "The Iron Bell" is a sparse track with a very Asian use of silence and space featuring flute, Mungenast's prepared guitar, and Bloom's bass harmonics with Proudman leaving his kit in favor of a couple gongs. "Luminous/Ominous" has the rhythm section setting up an easy groove for Field's excellent flute and sax work, with Mungenast content to wait nearly eight minutes before really making his presence felt on a really nice solo with some interesting tapping work (which is closer to Frank Zappa than Eddie Van Halen). "Sitar-Tha" has Mungenast playing electric and slide sitar in conversation with Field's alto over a simple vamp that gets stretched and contracted. The album builds in intensity, culminating with "Mungulator Ritual," where Mungenast adopts one of the sickest, most deranged guitar tones imaginable with Field attempting to match him with a tart tone and multiphonics in front of a surging, insistent rhythm that recalls the end of "If 6 Was 9." It's an impressive set that has got to be one of the most egoless sessions ever recorded. Well done. Despite the impromptu nature of this gathering, the end result is a session that fits in equally well with either Birdsongs of the Mesozoic or Cul De Sac's (one of today's finest purveyors of experimental psychedelic rock) catalog. There is a casual looseness to the rhythm section's rapport, with a dependence on melodic bass ostinatos and rubato drumming that veers from the impressionistic coloration of “Sitar-Tha” to the open-ended funk of ”Luminous/Ominous.” Field tends towards long tones and textural effects, rather than brassy showboating. Mungenast generally favors a methodical, cautious approach to his fretboard explorations within this psychedelic soundscape. L’album No Such Animal (pubblicato da Goat River/Innova) è firmato collettivamente dai quattro musicisti che partecipano al progetto, anche se il leader sembra essere il chitarrista Tim Mungenast che è affiancato dal saxofonista Ken Field, dal bassista Michael Bloom e dal batterista Jon Proudman. Siamo a Boston e Field è una delle menti più attive del gruppo ‘Birdsongs of the Mesozoic’, mentre il bassista e il batterista arrivano dal gruppo ‘Cul De Sac’. I quattro si sono ritrovati per una lunga jam session notturna dalla quale sono scaturite 5 lunghe e riflessive sezioni improvvisate in mezzo alle quali è stata incastonata una brevissima digressione evocativa di un minuto e mezzo. Il rock progressivo si meticcia con il free jazz, il minimalismo lascia spazio all’evocazione, la luce riflessa viene catturata da un prisma magico e si riverbera in forme sin qui sconosciute. Forme scheletriche che sbalzano la componente timbrica per riconnettersi nelle intersezioni neurali delle scansioni ritmiche, come fasci di fibre impazzite che non vogliono ritornare alle posizioni di partenza. ...The progressive rock itself meticcia with the free jazz, the minimalismo leaves space all' evocazione, the light reflected comes captured from a magical prism and it is reflected in shapes sin here strangers. It forms skeletal that they hurl the component timbrica for itself in the intersezioni neurali of the rhythmic scannings, how you do of fibers gone crazy that do not want to return the positions of departure. Compelling...Sneaky... a road trip with unusual landmarks passing by outside the windows.